The Lake Havasu Area Chamber Ambassadors held a ribbon cutting ceremony for Judy’s Art Gallery & Framing to celebrate its Grand Opening with new owners. Offering quality custom framing, art restoration/conservation, art cleaning and reparations with over one thousand frame choices. 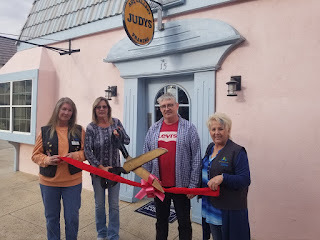 Judy’s Art Gallery & Framing is located at 2126 McCulloch Blvd. #15 in the Shambles Village. Attending the ceremony from left to right were Melissa Volquardson, Lori Burg – Owner, Henrik Nielsen – Owner and Terri Colella.